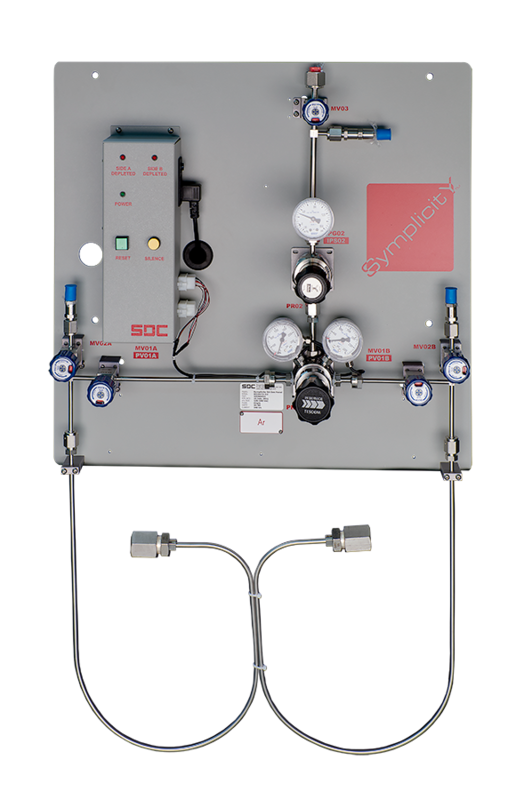 The SymplicitY™ UHP gas panel with auto-switchover is an Ultra-High-Purity gas panel designed for uninterrupted supply of gas to one or more points-of-use. The heart of this cost-effective process gas panel is the changeover regulator. When the primary supply cylinder comes close to depletion, the changeover regulator automatically begins intake from the second cylinder while delivering at a slightly lower delivery pressure. This pressure is raised by simply rotating the regulator handle 180 degrees. The depleted cylinder can now be replaced without affecting delivery from the new primary cylinder. 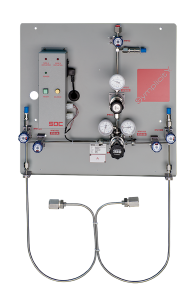 SDC surrounds this regulator with a HP design that offers safety, purity and performance in a budget minded package. The optional StatBox™ provides an audible and visual alarm when any one of the cylinders reaches its preset depletion limit. ONLINE, SIDE “A” DEPLETED, and SIDE ”B” DEPLETED LED’s provide quick visual status while the piezo audibly alarms when activated. 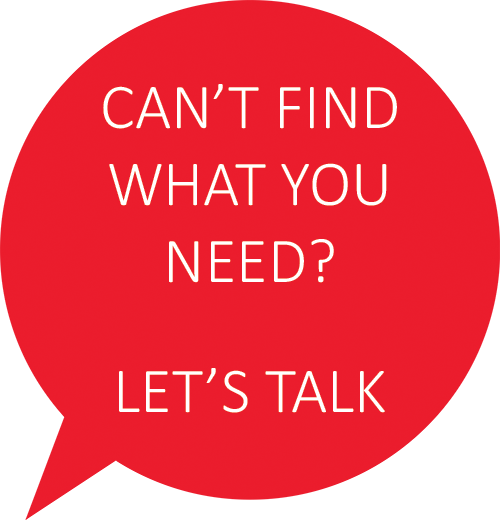 Process purity levels are ensured through the use of top quality 316L SS or Ni plated brass tubing and components. The flow paths include the switchover regulator, valves, gauges, fittings, CGA’s, optional check valves, and secondary regulator. Optional flex pigtails are SS w/SS overbraid. Pneumatic Supply adjustable to 90 psig 1 slm max. 1Process Purge adjustable to 80 psig 85 slm max. 1Vacuum Drive adjustable to 85 psig 85 slm max. 1Needed with PURGE/EVAC option only.